You can always expand your current Big Storage drive with more space (up to 40TB per Big Storage). Please note that not every filesystem / OS can handle disks larger than 2TB, so check if your filesystem / OS supports this before the upgrade. This manual assumes that you have already linked and partitioned your existing Big Storage drive successfully. If that is not the case, follow the manual for Windows or Linux / BSD first. Log in to your control panel, navigate to the 'BladeVPS' tab and click the name of your VPS on the left. 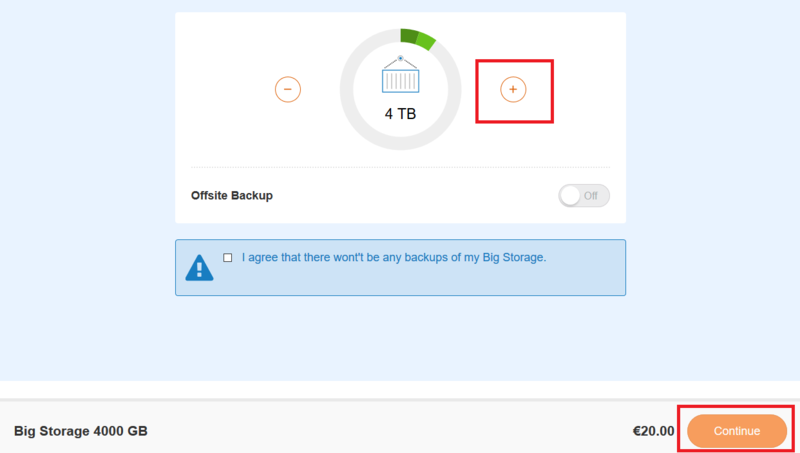 Directly below your VPS console, click the cogwheel next to 'Big Storage X TB'. Is this extra disk space immediately visible in my OS? You should be able to immediately see this disk space in your OS (with the exception of BSD, which requires a restart), but before the extra space can be used, it will first have to be added to a partition. You can create a new partition for this or you can expand your existing Big Storage partition. If you use the XFS Big Storage drive as a filesystem (as we recommend in our manual), you can expand the disk space using a number of steps. First, it is important that you have installed the correct version of parted on your VPS. Versions up to 3.0 and from 3.2 have the possibility to ‘resize’ a partition. If you use version 3.0 or 3.1 (which can be checked by using the 'parted -v' command), then you will first have to upgrade to version 3.2. Unfortunately, no update to version 3.2 is currently available for CentOS via 'yum update' and you will you have to install this via an alternative repository or by compiling 3.2 yourself. You can also use the "Linux Boot Rescue" environment of the console in which parted 3.2 is always available. You can start this by starting it on the console screen under 'Options'. Please note! This will restart your VPS, so do this at a time when your VPS is not used very actively. If 'b' is not the letter of your Big Storage drive, then replace it with the letter that applies to you. Using 'print', you can see the current total size and also where the current partitions begin and end. The size of the total disk also matters because you have to enter this value later. Then you get the question where the partition should end and here you fill in the (maximum) value of the Big Storage disk. Now close parted using 'quit'. For Windows Server, there is a separate manual with regard to expanding the space of your Big Storage drive. You can find this here.